Amino acid sequence derived from mouse FGF21 (Q9JJN1) (Met 1-Ser 210) was expressed, with a polyhistidine tag at the C-terminus. 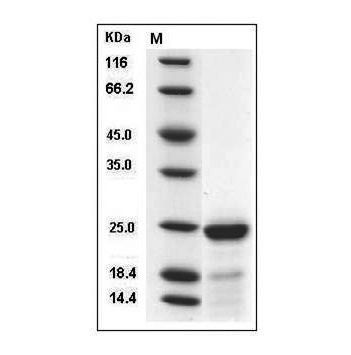 The secreted recombinant mouse FGF21 consists of 193 amino acids and has a calculated molecular mass of 21.3 kDa. As a result of glycosylation, the apparent molecular mass of rm FGF21 is approximately 25 kDa in SDS-PAGE under reducing conditions. Fig.SDS-PAGE analysis of Mouse FGF21 protein, His Tag. Always centrifuge tubes before opening. 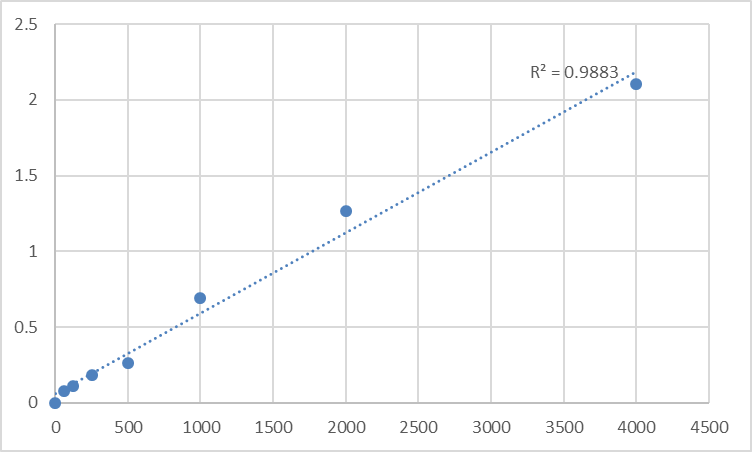 It is recommended to reconstitute the lyophilized Mouse FGF21 protein, His Tag in sterile ddH2O not less than 100µg/ml, which can then be further diluted to other aqueous solutions. 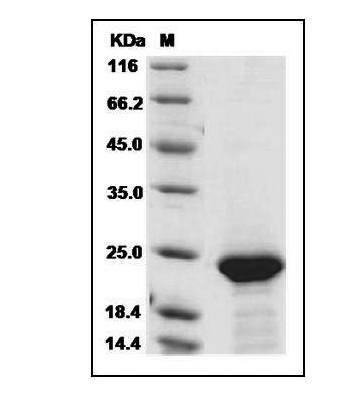 Lyophilized Mouse FGF21 protein, His Tag product should be stored desiccated below -20°C. Upon reconstitution, the protein should be stored at 4°C between 2-7 days and for future use below -20°C. For long term storage it is recommended to add a carrier protein (0.1% HSA or BSA). Please prevent freeze-thaw cycles. Fibroblast growth factor 21 (FGF21) is a member of the fibroblast growth factor (FGF) family. FGF family members possess broad mitogenic and cell survival activities and are involved in a variety of biological processes including embryonic development, cell growth, morphogenesis, tissue repair, tumor growth and invasion. FGF-21 has a hydrophobic amino terminus, which is a typical signal sequence, and appears to be a secreted protein. The metabolic regulator fibroblast growth factor 21 (FGF21) has antidiabetic properties in animal models of diabetes and obesity. FGF21 is a novel adipokine associated with obesity-related metabolic complications in humans. The paradoxical increase of serum FGF21 in obese individuals, which may be explained by a compensatory response or resistance to FGF21, warrants further investigation. 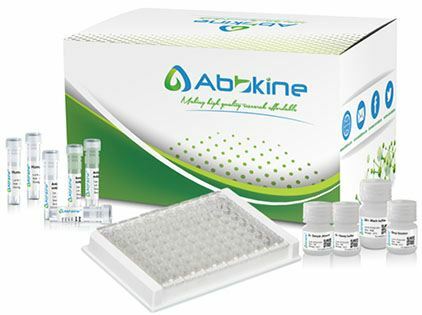 FGF-21, which we have identified as a novel metabolic factor, exhibits the therapeutic characteristics necessary for an effective treatment of diabetes.